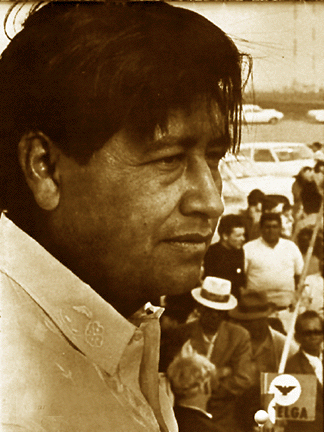 Cesar Chavez’s greatest achievement was his life itself, in which his deepest beliefs were carried out daily through his actions to improve the conditions of the campesino. This inspired hundreds and thousands of people to join his efforts to achieve social justice, and created actual change where many believed it impossible. This monument serves as a sacred reminder to subsequent generations of the importance of living a life at the center of one’s values and beliefs, as did Cesar Chavez. Modeled on a Mayan corbelled arch combined with mission colonial arches, this site pays tribute to Chavez’s respective Spanish and indigenous roots while referencing the conquest. The plaza is treated with colors derived from the Pre-Hispanic Codices, while the arch is finished with a pearlescent white to create a sensibility of reflective light within the architecture. Reflective light is also an important aspect of the United Farm Workers (UFW) eagle on the face of the monument. Originally designed by Richard Chavez for the UFW’s flag as a symbol to unite the people, the stacked glass eagle is composed of a reversed pyramid and provides the central element of the “triumphant arch.” The arch faces east to west receiving the daily movement of the sun through the passageway representing a rite of passage from worker to activist. In the interior of the arch, the central mural depicts a contemplative Chavez as a farm worker leader and organizer looking over the California fields where the historic grape strike took place, with the farm workers represented metaphorically as twisted vines. Above in a cloud, Chavez is joined by Robert F. Kennedy as he breaks a 25-day fast accompanied by his wife Helen and his mother Juana. The image highlights fasting as a cornerstone to his philosophy of non-violence. La Virgen de Guadalupe, the indigenous patron saint of Mexico and the revered symbol of the farm workers, blesses the struggle with roses. Lurking in the sky, a calaca (skeleton) represents the ever present need for vigilance, to ensure decent conditions for the workers and reminds us that the struggle is not over in the fields. In keeping with his humility, the exterior of the arch depicts not Chavez, but two campesinos bent over in the fields of California. One of Chavez’s most important achievements was the abolishment of the short hoe, which was responsible for many injuries to workers. The hoe is featured in gold to commemorate this fact. The opposite side of the arch includes two important personages to the movement: Dolores Huerta, co-founder of the United Farm Workers and Chavez’s partner in the movement’s endeavors, with one hand evoking her powers to persuade growers to amend the unjust treatment of the farm workers, and with the other hand representing the power of non-violent actions through marches and boycotts. Mahatma Gandhi is also depicted in the fields to honor him as Chavez’s inspiration for the real possibility of social change through non-violence and spiritual practice. Around the monument, Venetian tile patterns represent the pilgrimage as a major movement strategy for the field workers, as well as the many marches taken by the UFW interwoven with grape vines. 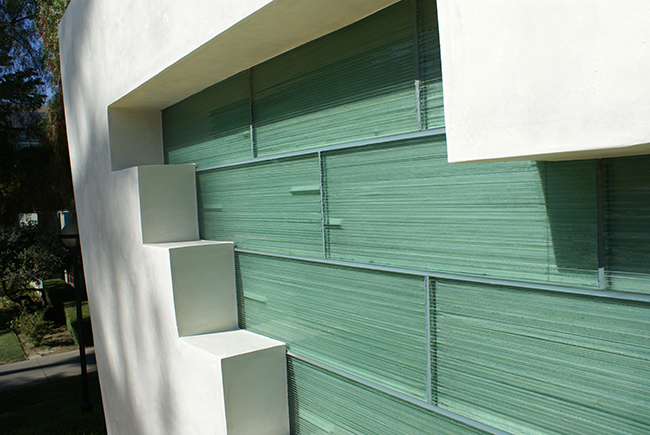 It is my hope that this arch will offer an introspective and meditative space for viewers to receive its message. May all those passing through it experience the passage from hope and inspiration, to education, and finally, to action for social and environmental justice.